During the calving season, it is not unusual to hear about unusual calves born with a variety of defects. Many of these defects are spontaneous events that are triggered by a variety of cues and are not necessarily genetic in nature. However, reporting these abnormalities to the ASA or other breed associations is vital to our ability to detect new genetic conditions. If you suspect you have an unusual calf, please let the ASA know right away. If the calf is stillborn, it is beneficial to report these cases immediately should we need access to tissue or DNA. We report this information to a consulting veterinarian and pathologist, Dr. David Steffen at the University of Nebraska-Lincoln. Dr. Steffen is well recognized for his knowledge on congenital diseases in cattle and has been a great resource for the ASA. Dr. Steffen reviews the case for suspected environmental or genetic causes of the condition. Should the defect seem genetic in nature, we ask for DNA of the affected animal to verify parentage and to archive for future tests. If genotyping has not yet been completed on the parents, we also ask for DNA of all potential parents to confirm the sire and dam. Occasionally Dr. Steffen asks for specific tissues to be sent to his laboratory for further review. The ASA covers all costs associated with DNA testing, veterinary bills, or postage associated with any abnormalities. Figure 1. 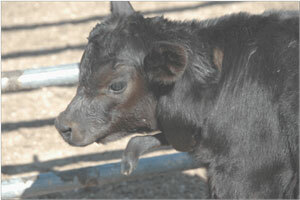 Calf with Developmental Duplication (DD), note the extra limb originated by its neck. From Flock and Herd, Case Notes on Polymelia (Supernumerary limbs) in Angus calves by L. Denholm, L. Martin, and A. Denman, December 2011. The ASA has developed a web-based archive that allows us to maintain information on abnormalities reported to the Association. This archive stores these reports securely and allows us to screen for similar conditions should they arise in the future. We greatly appreciate the reports we receive from producers. Time is critical in reporting these abnormalities and collecting tissue so please, don’t hesitate to send us information on unusual calves. Simmental Celebrates 50 Years in America! 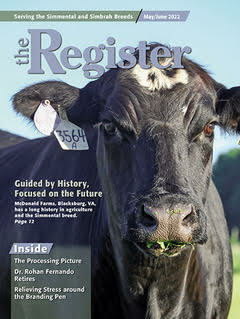 Visit our Blog: HAVE YOU HERD?